If anyone had wondered just how big the fake news problem on Facebook was, they only need to look at the current frenzy on the platform around three simple letters — BFF. 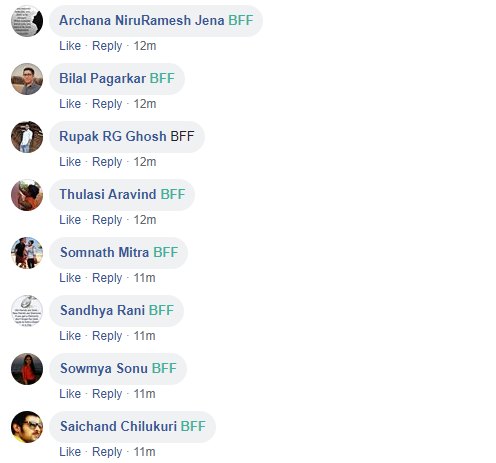 Thousands — perhaps millions — of Indians are furiously typing away “BFF” into their Facebook accounts, hoping to discover if their Facebook accounts have been hacked. As per the rumour, which had now spread on several large Facebook pages, the trick has been coded in by founder Mark Zuckerberg himself. If users type in “BFF” and it turns green, then they’re in the all-clear — their accounts aren’t hacked. If, on the other hand, the BFF stays a solemn black, that means their accounts have been compromised. All this, of course, is complete hogwash. 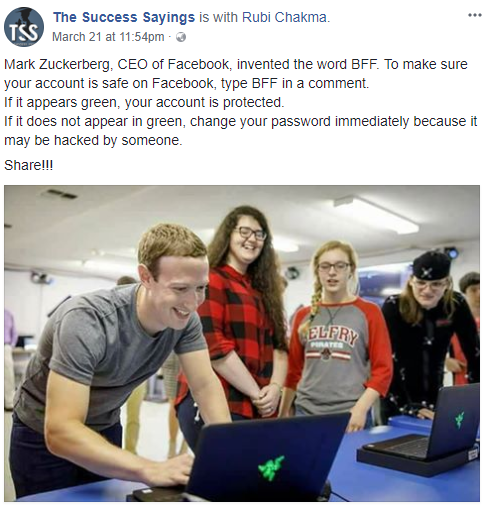 The BFF turning into green doesn’t have anything to do with an account being hacked — it’s simply a part of Facebook’s new feature in which it automatically gives some words a colour. Congrats, for instance, appears in red, and BFF, which is teen-speak for Best Friend Forever, appears in green. On apps which haven’t been updated, BFF still appears in black, giving people the impression that it turns green for some while stays black for others. The hoax is currently going viral in India. It’s not hard to understand why — with all the concerns that are going around Facebook’s privacy policies, people are worried if their data is secure, and the hoax plays right into their fears. The hoax also says that it’s been coded in by Zuckerberg himself, and there’s a certain romantic appeal about receiving a hidden coded message from the founder of the social network you’re on. And finally, it does seem to give results — for some people, BFF turns green, while for others, it stays black, seemingly at random. While the hoax by itself isn’t particularly harmful — the worst that people can do is spend a few seconds of their day uselessly typing in BFF — it does serve a purpose for its perpetrators. By getting people to type in thousands of “BFF” comments on their Facebook posts, page owners see increased engagement with their page from their audience. This fools Facebook’s algorithms into thinking their content is really popular, and makes their future posts reach more people. And the BFF hoax also shows how vulnerable people are to the most rudimentary tricks on Facebook. If hundreds of thousands of people can fall for a scam that makes their text change colour, one wonders how they can possibly parse through sophisticated political propaganda and hidden agendas. We’re truly living in an age of disinformation, and it can be brought along by something as innocuous as three simple letters.